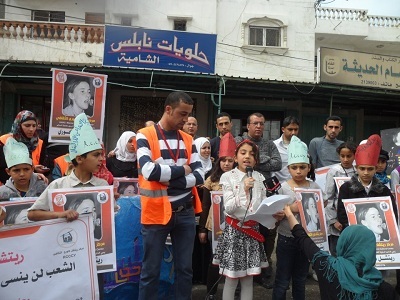 Residents in the town of Rafah commemorate the 10th anniversary of the killing of Rachel Corrie, March 16, 2013. My name is Heba. I am a 12-year-old girl from the town of Rafah, in the southern part of the Gaza Strip. I am a Palestinian. I love my people, and I care deeply about the entire world. Mr. President, my town is hurting. My people are hurting. Since the day I became aware of the place where I live, and the people around me, I saw little peace. There is so much pain here. I grew up under siege. But my mamma tells me there has been nothing but siege in Gaza even before I was born. My family traces its history of pain to 1948, when Israel was established on the ruins of my ancestors’ homes. It was then we became refugees. We are still refugees. 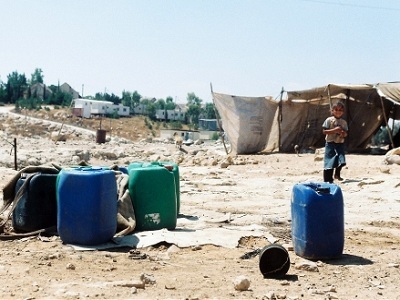 But things are getting even worse for us, as we continue to endure a war that doesn’t seem to end, and a siege that made us poorer than ever before. In the war of 2008, I remember how frightened we all were when the Israeli army killed and injured thousands of my people. Over 350 of those killed were children, just like me. My mother would hold us tight and sing for us all night, as the bombs fell all around us. Those scary times are often repeated, but I am not as afraid. The courage of my people taught me to be strong and proud. Ten years ago, a beautiful American girl arrived in our town. She was accompanied by several of her friends as they came to stand in solidarity with us and talk to the world about the suffering and bravery of the Palestinians. Those who knew her speak fondly of her, of how she tried to practice her funny Arabic, and how little girls would hold her hand and walk with her proudly around the town. Ten years ago, Mr. President, that girl, Rachel Corrie was run over by an Israeli military bulldozer, one that was made in the United States and paid for by the American government. The driver ran over her mercilessly, more than once. Beautiful Rachel died, sir while she was protesting the demolishing of our poor dwellings. That act of murder was not the first or the last committed against those who came to stand with us. And as you know, many thousands of our people were killed in more ways than I can tell you. Like Rachel, they were innocent, and so very beautiful. When I see you on television, I hear you speak of values like democracy, equality and freedom. But when our neighbors talk about the US government, they speak of the money and weapons that are regularly sent by your government and are used to carry out the horrific wars against my people. When will this stop? When will you turn your words into action? How would you feel if your two lovely girls live in Rafah, Mr. President? Will you still send money and arms to those who are tormenting the people of this town? We do aspire to achieve the same values you always talk about, but for our aspirations to ever be realized, please, stop sending weapons to Israel. Children will continue to die if you don’t do the right thing. And Mr. President, my people need their unity today more than any other time in the past. This unity is so important to us, since our division is strengthening those who have mistreated us, occupied us and besieged us for so long. However, every attempt at unity was obstructed by your government, which insists on keeping us weak and divided. It is time to let us find our common ground so that we may speak in one voice and have a leadership that truly represents our people. The people of Rafah, of Gaza, in fact all Palestinians, will never, ever forget Rachel. In our town, we call her a Martyr and we have paintings of her on many of our decaying walls. She was the proof that Americans don’t hate Rafah. Rachel died for us. Mr. President, I am still hopeful that you sincerely speak out against military occupation, demand an end to the siege, don’t send more guns to Israel, and don’t oppose our unity. Please don’t empower those who have tormented my family and me for so long. We will never give up the fight for our freedom, and we will always honor the legacy of our heroes – Rachel Corrie, James Miller, Tom Hurndal, Vittorio Arrigoni, Mohammed al-Durra, Iman Hajjo, Fares Odeh, Arafat Jaradat, and thousands of our heroes and heroines that will continue to inspire us until the day we seize our freedom. Wow so eloquent. So powerful. Will he even get to read it though. Obama is deaf, blind and a coward, a real coward!